I just finished making this up and I've already received my money's worth. There are certain tricks which I feel are worth the price of a subscription all by themselves. Mong these are Impact, Back to Aces, and Upside Down. This is another. John has been mentioning this in our correspondence for the last eight months but he didn't want to have it published until it was thoroughly audience-tested. I agreed. I saw him do it in Atlanta last week and saw a lot of possibilities. I will describe it below as he presents it and then follow it with some of the gags or bits of business he uses. In effect, the magician says that he wants to show the audience a trick using four coins. He takes a small change purse from his pocket and tosses out the contents. There are only three coins. "Okay, Mr. Jimrry. Let me have the other coin." At this, a little hand rises up out of the purse with the fourth coin. It tosses the coin into the magician's waiting hand. He then goes back down into the purse and the purse is closed and replaced in the magician's pocket. The Work. I hope you won't pass this by solely because you have to make it. I just made one up and it took all of twenty minutes (excluding the time for the glue to dry). The illustrations tell the story but I will add a few hints. To complete "The Thing" you will need a small change purse, a Vernet style thumb tip, black upholtery tape, white upholstery tape, Super Glue, a small rubber hand, and two felt tabs (optional but helpful). The hardest thing to get will probably be the four half dollars. which the hand removes in the proper location. Don't put them there now. Wait until you find the best location for the coin for your personal requirements. Now that the purse is gimmicked, it is time to prepare the hand. Cut the thumb tip off immediately above the knuckle. (If this is followed by a pool of blood and a rush of pain, you cut the wrong tip.) The reason that you cut the tip is to allow greater freedom of movement when your thumb is manipulating the hand. Super Glue the hand to the tip of the thumb. Notice how the hand continues the arch which the thumb forms (commonly referred to as "hitchhiker's thumb"). This again is a detail but it assures proper balance so that a little motion of the thumb will cause a larger motion of the hand. When the glue dries, you are ready to prepare the tuxedo. Take a little of the white tape and make a sleeve by taping it directly onto the thumb tip inmediately below the hand. This also covers the joint between the tip and the hand. When the shirt sleeve is completed, use the black upholstery to make a black jacket by taping it onto the thumb tip starting about 3/16ths of an inch below where the shirt sleeve started. Continue winding the tape all the way down to the bottom of the tip. If you will slip the hand gimmick through the hole in the back of the purse, you are ready for action. Play with it for a while. Note that with only a slight movement of the thumb you can cause the hand to slide in and out of the purse. If the gimmick is on the left thumb, your right hand opens and closes the purse. 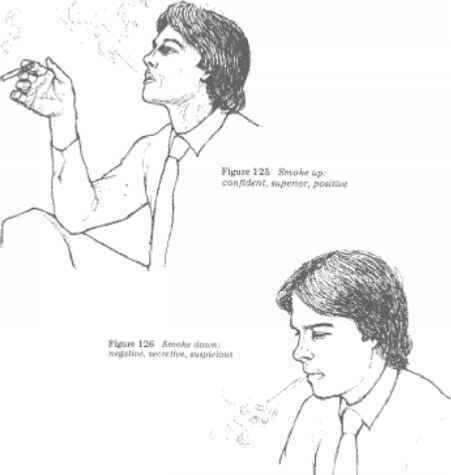 Also note that your left fingers and the purse cover the movements of the left thumb. To perform with the coins as described earlier, bring the hand down into the purse. Place three half dollars on the back of the hand, between the hand and the back of the purse. Place one half dollar in front of the hand resting on the two felt tabs. You may prefer to engage the coin with the rubber hand, this is done fcy placing the coin between the hand's thumb and palm, in the "grasp" of the hand. dose the purse and place it in your left coat pocket (if you use the left hand for the gimmick). I am right handed and prefer to leave the right hand available for other moves. When you are ready to perform, place your left hand into the pocket and engage the gimmick (the part of the thumb tip which is protruding from the hole in the purse) with your left thumb. Bring the purse out. The black tape on the gimmick helps to hide the gimmick but care should be taken to keep that side away from the audience. which allows it to hold things. If it were strictly vertical, the coin would fall off. Tilt the hand back as far as possible in preparation for throwing the coin. Now snap it forward, the coin should fly forward into the waiting right hand. Only a small movement ty the thumb is necessary to accomplish this. This is because of the flexibility of the thumb and the construction of the gimmick. Regurgitations. There are a lot of presentational possibilities with The Thing. He can be billed as "Mr. Purse." Or possibly, "Mrs. Jimny, The Woman With Masculine Hands." Another avenue would be to bill it as "The Thing" similar to the one on the old Adams Family television show. John has the hand wave hello, goodbye, and he shakes the hand. One of the strongest things he does with it is to have the hand ccme up empty the first time. Then he sends it down for the coin. The second time it canes up, it is holding the coin which it then tosses to the performer's other hand. 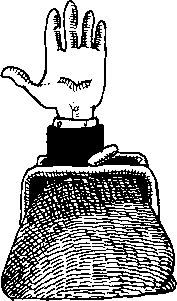 Using a squeeker (either in the mouth or the manual type) he closes the purse on the fingers. After the scream, he apologizes and continues. After using The Thing for a while, I rip the hand off and proceed into Roger Sherman's hilarious hand and eye routine. TO do this, I fingerpalm an extra hand in the right hand when both hands go into their respective pockets looking for the purse. After shaking hands with The Thing, I grab him with the right hand. 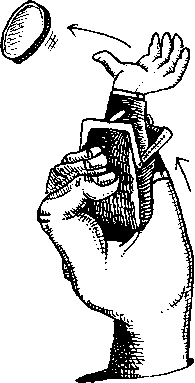 The left thumb draws the gimmick back into the purse while the right hand removes the extra hand. All of this is done amid screams from the purse. Another possibility, one which I haven't yet used, would be for the hand to produce the eyeball for use in Roger's routine. You could have him simply ask The Thing (or Mr. Jimny) if you could borrow his eyeball. He removes it and hands it to you. The other version would be for him to display his empty hand. You cover the purse with a silk so he can do a trick. When you remove the silk, he is holding the eyeball. Act disappointed with, "Sure, just removed your eyeball. Anyone can do that." Another idea which I haven't tried would require a slightly larger purse. The hand ccmes up empty. I would send it back into the purse for the coin. A foot would emerge from the purse while a lot of noise would emanate from the bowels of the purse. Apparently The thing is turned upside down searching for the coin. A few moments later the foot disappears and the hand emerges with the coin. This would be accomplished using two gimmicks. I haven't yet decided on the best way to produce the noise from inside the purse. I think it would be funny to have two hands come up from the purse at the conclusion of the coin trick. They would be applauding the last trick. "Well, I'm glad to see someone enjoys magic." These are just a few of the possibilities with The Thing. They only scratch the surface. John has provided an excellent opportunity for you to use your own creativity to see what you can crane up with to do with the basic prop.